The capture of the biggest trout of the season at Rutland Water is always news, but especially when it’s a strain that the management don’t even stock there. Peterborough angler Leon Smith landed the 10lb 10oz fish while boat fishing on the South Arm. But this was no brown or rainbow trout. In fact Leon’s fish was identified as a blue trout – which must have got in there by accident. 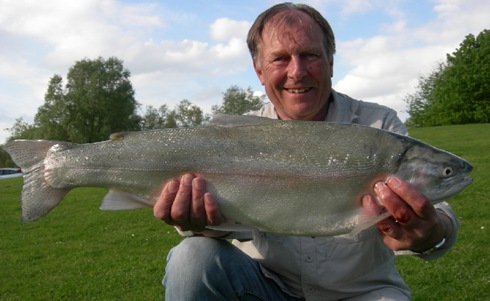 Fishery senior warden John Seaton told Angler’s Mail that although it’s not the first blue trout ever to come from the Anglian Water venue, it’s certainly the biggest. “This 10lb 10oz specimen will be a record blue trout the water. The wardens have seen them up to 5lb come out of Rutland, but nothing as big as this,” said John. Leon tempted the blue while fishing a team of nymphs, the fish taking a Diawl Dach pattern fished under the bung.